At the end of a red dirt road in Kemper County Mississippi is a little known local landmark, a treasure from a bygone age. 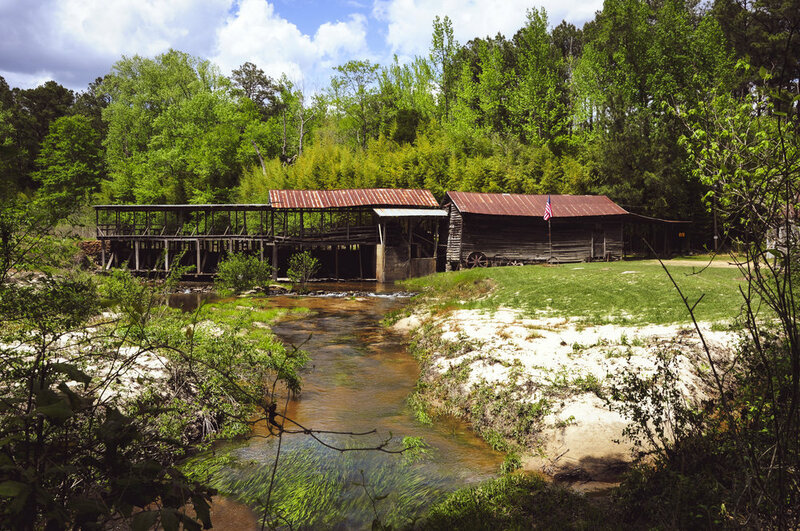 People come from near and far to visit the only water-powered gristmill left in the state of Mississippi. It’s been featured on multiple tv shows and in numerous magazines such as Dirty Jobs, Mississippi Roads, American Profile, Out Here Magazine, and by bloggers, photographers, and YouTubers all over the internet. A simple internet search brings up dozens of pictures, videos, and information galore. I’ve been living in Noxubee County for 11 years now and finally made my first trip there last year. I decided last minute that day to go and arrived too late to see the mill running and grinding grits and meal, but that just means I need to make another trip. Allie went with me and was totally unenthused and told me the whole thing was boring until we got there. She finally got into it and I had a hard time getting her out of the creek and the gazebo swing and back in the car when it was time to go. Bless her bones she just doesn’t get her momma’s enthusiasm about old buildings. Maybe one day though...I can hope...can’t I? Sciples Mill really is a hidden treasure. 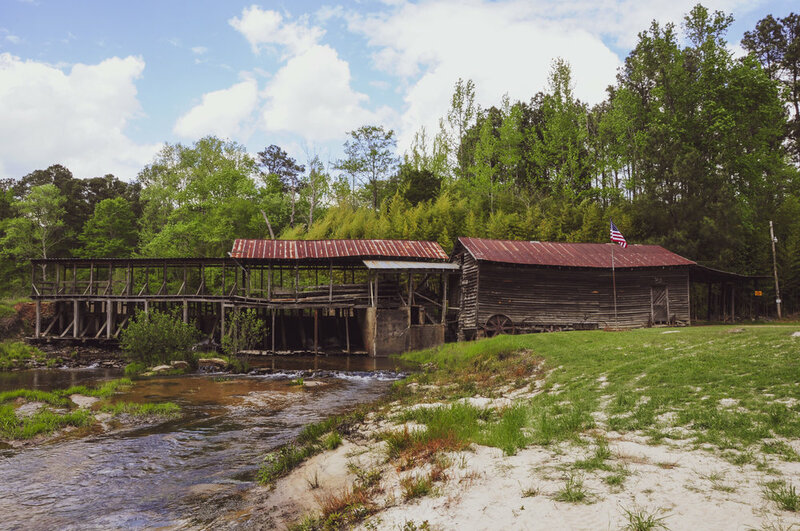 Nestled in the hills of Kemper County near Dekalb it is one of less than 1000 gristmills both in working and non-working condition found across the United States. The fact that Sciples Mill is still running, milling for the public, and producing product for sale on a regular basis is quite a singular accomplishment. The original mill was built in 1790 by a Dr. Hunnelly who had moved to Kemper County from Kirshow County, South Carolina. During the following 40 to 50 years four different families owned and operated the mill until the Sciples family purchased the mill and buildings somewhere between 1830 or 1850 from Mr. Footes and Rose McManis. The Sciples have since run the business, almost continuously, for over 225 years. The only downtime was due to a tornado on November 26, 1973 that destroyed the original building. The mill building was rebuilt on the same floor and foundation and reopened on March 4, 1974. In all the years the Sciple family has run the mill the price for grinding grain has not changed, because according to Edward Sciple the 4th generation owner, “why not? The price of fuel hasn’t gone up.” The “toll” or price for milling is an 1/8th of what has been brought to be processed or a gallon for every bushel milled. 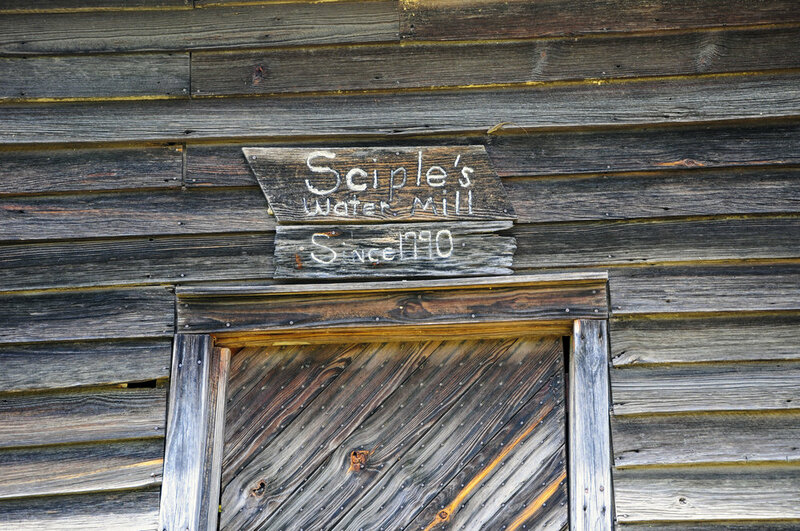 Seven generations of Sciples have run the mill and the whole family helps out with production. Edward, his son, grandsons, and granddaughters all help weigh and bag cornmeal, grits, whole wheat flour, and fish fry batter. It’s truly a family affair. Why though, all the pomp and circumstance surrounding a simple frame building and an apparatus that dates back before the turn of the last century? Glad you asked….. 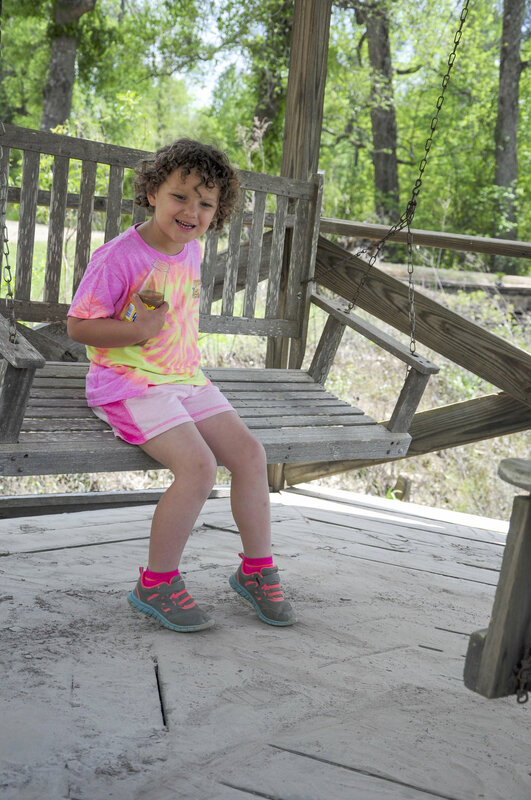 Anything better on a summer day than a Yoohoo and a swing? Gristmills have been in existence for thousands of years. The oldest recorded gristmill dates back to 71 B.C. in Asia Minor, which is modern day Turkey. The machinery in gristmills have evolved and changed over time but the concept has stayed practically the same. Two large, round stones stacked on top of each other grind grain placed between them producing flour or meal that can then be baked into bread or other foodstuffs. In early US history, locals would bring their grain to the gristmill, and the miller would grind it for a percentage called a “miller’s toll” in lieu of cash. In that early American economy, money was in short supply and an exchange of goods was often easier and many times more desirable in the moment than coin. While wind-powered mills definitely existed, most American mills were water powered, a technology that settlers had brought with them from the British Isles and Europe. As far back as 1086 a survey in England notated 5,624 water-powered mills, a testament to their efficiency and importance. The first gristmill built in the American colonies was built by John Jenney, one of the original pilgrims in Plymouth, Massachusetts in 1636. Water Mills were commonplace in the 18th century when Sciples Mill was built and more than 100,000 gristmills dotted America’s countryside by the 1850s. Farmers needed access to a mill within a day’s travel by wagon so every town and hamlet had their own gristmill. Even in Noxubee County the towns of Macon and Brooksville each had their own mills - even if the towns were only 7 miles apart. Before cars and road improvements made travel easier a mill could be found every few miles as all you needed for a mill was a steady and reliable water source. Mills quickly became the social centers and gathering places for the community with people coming weekly or monthly to grind flour or cornmeal. While waiting to take their turn family and friends would catch up on the local gossip and news. Newspapers were often posted on the side of the building as well as local announcements. Children could swim or fish in the mill pond while their parents socialized. Aside from church, it was one of the precious few opportunities for socialization families had living in a rural area. The grindstones at Sciples Mill date from the 1790s and weigh 1600 pounds. The milling process causes very little wear to the equipment and grinding stones can last centuries as they only touch the grain and never rub against each other. The water wheel was purchased in 1880 and can grind 32 bushels per hour and develops 250 to 300 horsepower. The mill is powered by a Leffel Water Turbine Wheel and until 1880 the turbine was made of wood built by an English mechanic Sam Vernon. The only maintenance to the milling equipment was done in 1946 when a homemade bushing was used to repair a, “wallered out hole.” The water wheel is powered by a pond fed by Running Tiger Creek. The water is collected in the pond which holds 25 to 30 acres under water and is controlled by a dam and floodgates. A lever released inside the building opens a watergate releasing the water to flow into the spaces of the waterwheel causing it to turn, and a shaft attached to the water wheel turns the grinding stones. While it is a somewhat simple system it does require careful attention to detail. It is a constant battle to control the water. If it rains too much and the gates are not opened to drain excess water off the pond it can cause flooding and wash away the entire mill building. Mr. Sciples, who lives next door, constantly monitors the water level. He has a light rigged at his home that is activated by the water level. No matter the time of day, the weather conditions and water level must be maintained and monitored. On a side note until the mid 1950s the mill also ginned cotton at 25 to 30 bales a day and sawed lumber producing 10,000 board feet per day. The building before the tornado had been 2 stories with the grain mill on the ground floor and the cotton mill on the second. The sawmill was located under the shed over the creek. By the early 1900s though, these small stone grinding mills could not keep up with the larger, faster, and more efficient electric powered steel roller mills. Most came to a halt and went out of business due to this easier, more efficiently produced flour. Many bakers continue to prefer stone ground flour to any other, even Martha Stewart is on the stone ground bandwagon. Why in our modern age would people seek out these stone ground products? Both professional and home bakers and those with celiac disease and other digestive issues seek out stone ground flours due to the fact stone grinding produces a more nutritious and easier to digest flour. The lack of heat in the grinding process preserves the grain’s nutrients and flavors, and stone milling also produces a flour that is smooth and not jagged simply due to how the grain is ground. The miller can determine the quality and texture of the flour based on how far apart the grinding stones are. The mill is only open Saturday mornings to the public due to Eddie Sciple working as an instructor at a local community college, but if you’re not able to make it during operating hours never fear. There is a stand that sits outside the entry door where off hour customers can pick up a bag of meal or grits and leave their money in an honor box. The family doesn’t know if the box ever comes up short, Mr. Sciples has never kept up with it. 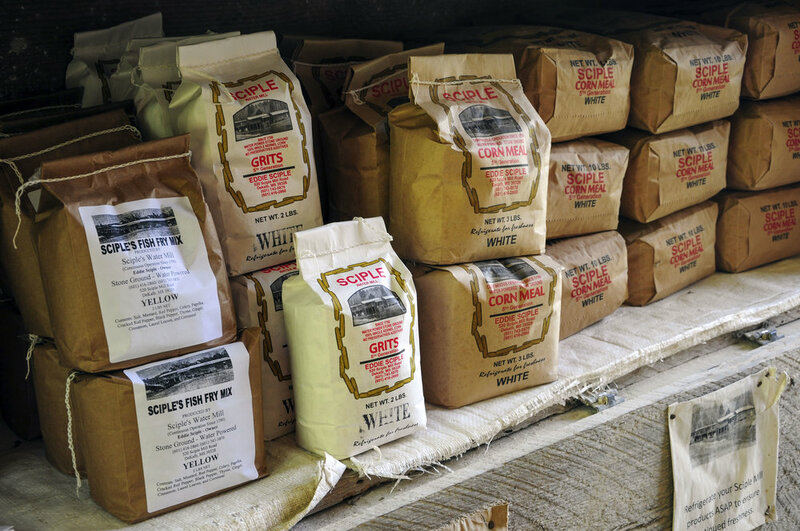 The Sciples use the toll they charge to produce their line of cornmeal, whole wheat flour, grits, and fish fry mix. He sells to walk-up customers, local grocery stores in Philadelphia, Brooksville, and Macon, and has shipped his products across the country. I can attest that the grits are fantastic. They have a flavor and a texture that is much different than the usual “quick” grits and while they take a little more time to cook are definitely worth it. Gristmills in Mississippi and the South operated into the early to mid 20th century providing an invaluable service to their communities. The owners often went on to become wealthy influential members of their communities. Many became larger business owners, bankers, etc. with the start their gristmills gave them. The mechanization that swept the South after WWII gradually phased out little businesses like these that were an integral part of a way of life that is all but lost in the modern south. How lucky are we to have this piece of living history still operating in our little corner of Mississippi? Thank you to the Sciple family for keeping their family business alive!